The saga of dark elf Drizzt Do'Urden has become a fixture in the fantasy genre, with a string of New York Times best-selling novels going back to 1988. 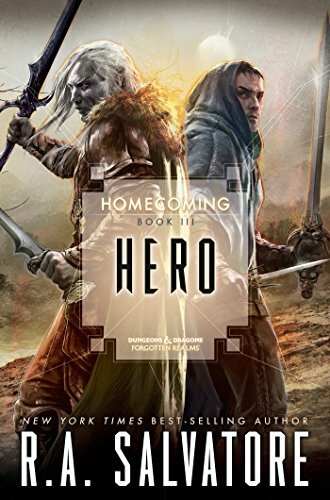 Hero is the follow-up to Maestro and Archmage, and final book in the Homecoming trilogy. Something akin to "peace" has come to the Underdark. The demon hordes have receded, and now the matron mothers argue over the fate of Drizzt Do'Urden. Even so, it becomes clear to one matriarch after another that while the renegade drow may come and go Menzoberranzan, the City of Spiders will crawl forever on. And so Drizzt is free to return to his home on the surface once again. Scores are settled as lives are cut short, yet other lives move on. For the lone drow there is only a single final quest: a search for peace, for family, for home--for the future. Hero picks up where Maestro left off, in a sweeping climax to an epic tale.